Overall Longines Global Champions Tour ranking frontrunner Ben Maher (GBR) will head to Germany’s capital city of Berlin this week, looking to extend his 38-point lead against a strong international field for the 12th leg of the series. The powerhouse destination will welcome four out of the top five in the LGCT Championship, all vying for valuable points in their bid to take the 2018 title as the season gallops deep into its second half. Current leader Maher (GBR) has two LGCT Grand Prix wins under his belt (Madrid and Saint Tropez, Ramatuelle), and travels to Berlin with 237 points overall. So far the British rider has collected 7 scores out of his possible 8 counting towards the Championship, and with five events left in the 2018 the Olympic gold medallist is looking strong for a podium finish this year. On 199 points and in second is two-time LGCT Champion Edwina Tops-Alexander (AUS), who will head to Berlin just one point ahead of 2017 Champion and World Number 1 Harrie Smolders (NED) who has a tally of 198 points. Italian star Alberto Zorzi (ITA) has been knocking on the door of an LGCT Grand Prix win all season, and will be hoping to better his current score of 162 points overall, where he sits in fourth place. The German capital is also the largest city in the country, steeped in history with famous monuments including the Brandenburg Gate. Berlin’s vibrant cultural scene makes it one of the most visited cities in the world. 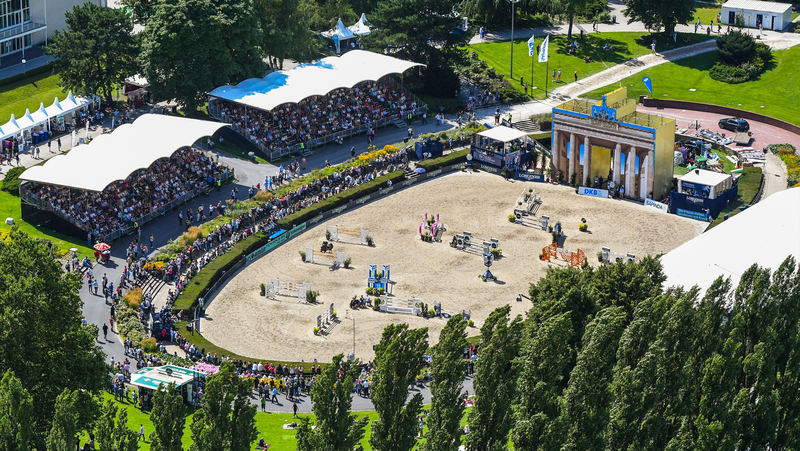 A new destination for 2017, last year saw packed grandstands and fans lining the banks of the amphitheatre around the arena for the inaugural event in Berlin - contributing to a phenomenal atmosphere as home fans witnessed local hero Christian Ahlmann (GER) take the debut LGCT Grand Prix win. This year's event, from 27th - 29th July, will again welcome top riders from all over the world, including illustrious names such as Rolf-Göran Bengtsson (SWE), Lorenzo de Luca (ITA), Olivier Philippaerts (BEL), Peder Fredricson (SWE), Bertram Allen (IRL), Simon Delestre (FRA), Martin Fuchs (SUI), Roger-Yves Bost (FRA), Maikel van der Vleuten (NED), Michael Whitaker (GBR), Pius Schwizer (SUI) and Sergio Alvarez Moya (ESP). With top German riders in attendance, including 2017 LGCT Grand Prix winner Christian Ahlmann (GER), Ludger Beerbaum (GER), Marcus Ehning (GER), Daniel Deusser (GER), Christian Kukuk (GER), Philipp Weishaupt (GER), Mario Stevens (GER) and Laura Klaphake (GER) all heading to Berlin this weekend, this second event in Germany will offer fans a up-close opportunity to witness their show jumping heroes in action.